As we age, the effects of gravity on the human body become more noticeable. In the face, the supporting tissues of the cheeks weaken, and facial fat compartments (which give the face its natural youthful contours) are gradually diminished. The jawline that used to be firm and tight forms jowls, corners of the mouth drift downwards, and the lower face and neck sag. 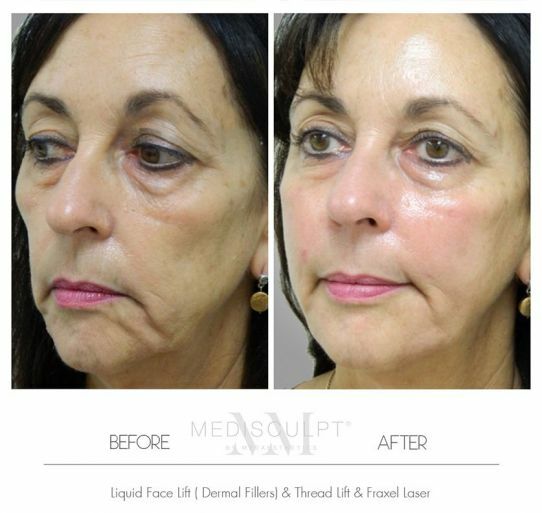 At Medisculpt™, we offer the minimally invasive thread lift procedure to patients in their thirties and early forties as a preventative treatment to minimize facial ageing and sagging. A thread lift is a delicate cosmetic procedure that provides support to soft facial tissue and gently lifts sagging facial skin. It is an excellent preventative treatment to help minimize facial sagging from mid-thirties onwards. This creates a lifting vector and provides anchor-like support to facial structures. Any exposed threads are then trimmed off using scissors. Dr Ehsan Jadoon has been the national trainer for Promitialia® Threads and has successfully performed hundreds of thread lifting procedures using Silhouette Soft® & Promoitalia® threads. Which type of Anesthesia is used for this procedure? We routinely perform this procedure under local anaesthesia while the patient is awake. We also offer this procedure under Twilight Sedation in an accredited Day Hospital in Subiaco if the patient prefers to be asleep during the surgery (Additional costs are associated). Various thread lifting procedures have been trialled for many years with variable outcomes and often suboptimal clinical results. Why is that? Thread lifting was introduced several decades ago in Europe using smooth-surfaced sutures made of non-absorbent synthetic materials. These threads could easily slip and were not able to hold on to the skin properly resulting in subclinical outcomes. Also, the doctors performing earlier procedures did not have the experience in the optimum patient selection. It took them several years to gain the necessary knowledge to iron out the inherent flaws and potential complications associated with this technique. It is now clinically established that thread lift is not an alternative to a surgical facelift. It is, however, an excellent facial rejuvenation procedure to prevent facial sagging as a preventative treatment when performed by an experienced doctor. It can also help lift the sagging facial contours when combined with facial volumizing procedures such as dermal fillers. It is imperative to choose the right doctor when it comes to Thread Lift. In inexperienced hands, Thread lift often results in suboptimal results and adverse clinical outcomes. For your peace of mind, at Medisculpt™, we have the most extensive range of Fractional CO2 Lasers to help reduce any type of scarring whether related to a surgery or trauma. This depends upon various factors. Most patients report longevity of 1.5 to 3 years if their body weight remains stable. Due to the absorbable nature of threads, more threads can be inserted at any time down the track to maintain the results over years to come. This depends upon the number of threads used and whether thread lift is performed alone or is combined with other procedures. Most patients can go back to work the same day. However, some patients may require a supportive micropore tape applied on top of the skin to take the pressure off the threads and help them settle in the place for first three days. Therefore, we recommend taking three working days off work to be on the safe side. What are the alternative treatments to Thread Lift? At the time of your consultation, Dr Jadoon will be able to advise you as to which facial rejuvenation treatment option is best suitable for you. As mentioned above, Thread lifting is becoming a common preventative anti-aging treatment in patients in their 30's and 40's.